A redesigned modular Mac Pro -- teased in April 2017 for professionals that want to upgrade faster -- won't ship until 2019, Apple declared on Thursday. The Mac Pro hasn't seen a major update since 2013. "We want to be transparent and communicate openly with our pro community so we want them to know that the Mac Pro is a 2019 product. It's not something for this year," Apple's senior director of Mac hardware product marketing, Tom Boger, told TechCrunch. 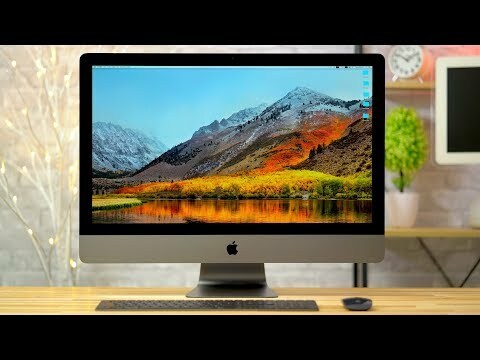 The executive added that Apple is informing people now since professional customers may be weighing whether to buy an iMac Pro or hold off a few more months. Apple's global marketing chief, Phil Schiller, confirmed that work is continuing on a standalone monitor. In fact the company has created a newly-disclosed group called the Pro Workflow Team, led by John Ternus and working in close cooperation with engineers. The company is hiring full-time and contracted artists to produce media projects that can be used to test Apple's hardware and software. "We've been focusing on visual effects and video editing and 3D animation and music production as well," said Ternus. "And we've brought in some pretty incredible talent, really masters of their craft. And so they're now sitting and building out workflows internally with real content and really looking for what are the bottlenecks. What are the pain points. How can we improve things. And then we take this information where we find it and we go into our architecture team and our performance architects and really drill down and figure out where is the bottleneck. Is it the OS, is it in the drivers, is it in the application, is it in the silicon, and then run it to ground to get it fixed." "We said in the meeting last year that the pro community isn't one thing," added Ternus. "It's very diverse. There's many different types of pros and obviously they go really deep into the hardware and software and are pushing everything to its limit. So one thing you have to do is we need to be engaging with the customers to really understand their needs. Because we want to provide complete pro solutions not just deliver big hardware which we're doing and we did it with iMac Pro. But look at everything holistically." The entire effort goes beyond the iMac Pro and the 2019 Mac Pro -- with external GPU technology springing from it. The Pro group as a whole is examining not only workflows of customers in detail, but also examining the culture of Apple's hardware development, and how the company makes decisions about what it builds and how it does it. And, the group is hiring. "We've gone from, just, you know, engineering Macs and software to actually engineering a workflow and really understanding from soup to nuts, every single stage of the process, where those bottlenecks are, where we can optimize that," said Boger. "Because we build the hardware the firmware the operating system the software and have these close relationships with third parties we can attack the entire stack and we can really ferret out where we are we can optimize for performance." When asked if the Mac Pro was intended for 2018, Apple denied that there has been any alteration in the roadmap. Additionally, Ternus and Boger made it clear that through the design process a "modular" approach is still the focus of the machine -- but didn't go into any large amount of detail about it. "I don't think that the timeline has fundamentally changed," said Ternus. "I think this is very much a situation where we want to measure twice and cut once and we want to make sure we're building a really well thought out platform for what our pro customers are doing today. But also with an eye towards what they're going to be doing in future as well. And so to do that right that's what we're focusing on." "There is absolutely a need in certain places for modularity." said Ternus. "But it's also really clear that the iMac form factor or the MacBook Pros can be exceptionally good tools." Apple's unexpected announcement in April of 2017 came after years of concern from professional users, many of whom believed that Apple had abandoned the pro market. In a meeting with journalists, Apple revealed that most professional users rely on the MacBook Pro or iMac, while the Mac Pro accounts for just a "low single digit" percentage market share. At the time, it promised an iMac with "server grade" components was coming in 2017, with the iMac Pro being announced at WWDC 2017, and shipping in late December. "One of the good things, hopefully, with Apple through the years," Schiller said in April 2017, "has been a willingness to say when something isn't quite what we wanted it do be, didn't live up to expectations, to not be afraid to admit it and look for the next answer." So fully 6 years between them by 2019, that's crazy to think of the gap left. That a very long time in silicon terms. The "pro workflow team" is encouraging. I'm hoping for myself it allows a lot of min/maxing, not fixed to relatively high end hardware on all parts like the iMac Pro. I need a lot of CPU for data science, but a GPU goes entirely unused, so I wouldn't need Navi Pro with HBM2 adding to the cost. Trust me. Wall Street will spin this as negative and AAPL will drop. Sell Sell...and buy back before market closes to make some bucks. In fact the company has created a newly-disclosed group called the Pro Workflow Team, led by John Ternus and working in close cooperation with engineers. The company is hiring full-time and contracted artists to produce media projects that can be used to test Apple's hardware and software. It doesn't mater what division the app is created in as long as input and direction is coming from the appropriate sources. In this case, the Pro Workflow Team. Yes yes yes yes yes!!! Woooooooohooooo! Team 🍎 💪🖖 🎶 with a bowl of awesome sauce! Depressing how behind the curve Apple is here. Probably too much focus on portables, with iPhone sales plateauing, they are looking to grow other divisions. Hopefully the team will fix it. With how things have progressed, if the rumour had said late-2018 I'd have just assumed it wouldn't ship until 2019. That all depends on factors we don't have privy to. Size of team, planned HW to be used which may not be available yet, certain code that won't even be hinted at until WWDC for an Autumn release, etc. All Apple has to do for modularity is look at the gamer built PC industry! They been doing this for at least 7 years and counting! Certainly, the gamer built PC industry is a good place to look for modularity. The main problem i currently see in this approach is thermal management, as GPUs and other coprocessors coming in the following years are consuming 500 Watts or even more. Other than that, apple seems to treat professionals like dumb folk who cant even put a stick of memory into their computer. That may have been a worse seller than the Mac Pro line. I have no problem with them bringing it back, and I'd certainly consider it for my next MBP if they did because I almost always use my Mac, but I don't see that happening. So a whole 100 people can buy it? You do realized Apple dropped this model because it wasn't selling right? Just because there's a very small group of people whining really loudly about the lack of a 17" MBP doesn't mean its what the general market wants. Apple knows more than you or I what it needs to build here. So to answer your question, hell will freeze over before Apple releases a new 17" MacBook Pro. You folks need to give it up already! We don't know. Assuming the rumour has truth to it, we can't even be sure if there was something lost in translation about calendar and fiscal years which could mean that fiscal 2019Q1 is calendar 2018Q4. Well considering how much more revenue iPhone or even Apple's services division makes versus Mac Pro sales (a niche market), I'd say its a good investment by Apple. There's a reason why Apple renamed itself to Apple, Inc from Apple Computer.